Since I know live in Portland, Oregon I will probably use TriMet here as an example of many of my postings just like I did with Utah Transit Authority when I lived there. I will also use other transit agencies I am familiar with such as Metro in Los Angeles and Spokane Transit Authority in Spokane. However, I will not try to step on the toes of Portland Transport, an excellent transit related blog that does a great job of covering news in the area. TriMet like many agencies still have a antiquated number system part of which is descended from its predecessor agencies. The number system is a hog pog of numbers that don't tell the person much information about the service. However, many agencies have created new number systems to make their route numbers make it easier for customers to understand the system. The late Southern California Rapid Transit District in Los Angeles was one of the first agencies to do this. From the late 70's through 1983 the RTD renumber all its routes so a person only had to look at the number to know if the bus traveled to downtown Los Angeles or if not if traveled primarily north-south, east-west or if it was express bus or something else. Meanwhile Jarrett over at Human Transit talked about creating a number system that told you the frequency of the routes. Lets use these concepts to see how you can renumber a transit system to make it more customer friendly and easier to use. Of course there is always the people who don't like it when routes change, but in the long run what is most important that it would make the transit system more customer friendly for all the riders. Those familiar with TriMet will know that there is only one route in the 200 series and only a few more in the 300 series but the point is to make the system easy to understand. You could combine both of those into the 200 series and adopt from their. In addition there is one odd ball route which is the current 154. It starts at the Oregon Transit Center then travels across the Willamette. You could put this route in the 500 series since most of its route is west of the Willamette or in the 600 series since its connection with the rest of the network is at Oregon City. Also, TriMet currently has no limited service routes but this is an example and in the future TriMet should look at instituting limited stop service on busy corridors which is something I will be posting about in the future. While you could argue semantics, this is a general renumber system that would make a system more customer friendly and easier to use. It could be adapted by any agency to not only designate where a bus goes but also the frequency of route. Its been three months since I moved to Portland and started regularly riding TriMet. Since I am a numbers guy I like to keep track of the number of vehicles I ride and how many times I ride them. Not sure if anyone really would care about these numbers except for fans, but here goes. The routes I ride most often are: 44, 54, 57, 78, MAX, and WES. (sorry the columns did not come out properly). As you can see from the numbers since I ride the 44, 54, and 57 most often on the bus side the buses assigned to those lines (the '97 Gilligs to the 44 and the 2009 DL40LFRs to the 54 and 57) are the ones I have ridden the most. I ride WES once per day two or three times per week and it seems like every time I get the 1001. I have never been in a RDC before and I am hopping to ride those this Friday if scheduling works out. If anyone knows how many of the older buses and the Bombardier cars are still in service, I would be interested in finding out. I plan to update this as time goes on. I have seen a lot of comments lately on different blogs on whether transit lines should deviate or not deviate into a transit center. The Seattle Transit blog has an article about the new Edmonds transit center which discusses this issue. There is two general thoughts on this issue: One thought is that all buses should deviate into a transit center and the other train of thought is that through routed buses should not if it is not a far walk from the transit center. The people who have the latter opinion generally feel that deviating to a transit station slows down the route too much and wastes precious time. As always you need to take more into consideration than looking a things in just black and white. Lets use the TriMet's Barbur transit center as an example and how to evaluate if routes should be deviated to the transit center. Currently the only full time TriMet route that services the Barbur transit center is TriMets marathon route the 12 from Sherwood to Gresham. It is also served by SMART from Wilsonville along with rush hour routes 64 and 94. Two routes come close to the transit center but do not service it: Route 43 makes a turn in front of the transit center from Barbur Blvd to Taylors Ferry Road while route 44, a route I am now taking every day goes by one block away. For anyone that is familiar with the area, you know that this area is not pedestrian friendly in anyway shape or form. In fact I have never walked in the area, I have only traveled through it either by car or bus. 1. How easy will be for riders to transfer from one route to another without deviating? In this case with the pedestrian hostile environment in this area making transfers from the routes that service the transit to route that don't is not pleasant. If the transit center is in a pedestrian friendly environment, walks from one route to another is not a major problem. However, many transit centers tend to be in suburban areas that make walking away from a transit less friendly than a transit center located in a downtown area. 2. Would ridership be increased by deviating the routes? For this purpose using Barbur is probably not the best example since the 44 parralles the 12 within a mile or two for most of its route and then joins the 12 on Barbur after it leaves Capital Highway. However, Route 44 is one of only two bus routes that service the largest of Portland's Community College campus at Sylvania. By rerouting the 44 into the transit center it would allow more convenient transfers from the PCC campus to the 12 for those traveling along the Barbur corridor plus allow direct connections from the 44 to SMART. The connection from the 44 to the 12 will not be a big factor but the one to SMART will be. Then there is the route 43 that travels from downtown to Washington Square Mall. This route only runs Monday through Friday and is not one of TriMet's better performers. Because of the nature of the 43 route, rerouting through the transit center will not adversely affect its schedule but it does have the possibility of increasing ridership by improving connections from the 43 to SMART and also the 12. 3. The third factor which is what many anti-deviation people focus on is the time loss for routes to deviate into the transit center. This mainly becomes a concern for trunk routes and express routes. In the case of the 12 little time is loss with the deviation to the transit center. The routes travels right past the transit center and looses probably less than a minute or two serving it. In addition ridership would be negatively affected if riders had to walk across Barbur Blvd to reach the transit center. To give an example of route that should not be rerouted to service the transit center is the 96. This route travels right pass the transit center on Interstate 5. While the southbound on ramp to the interstate is just a block away from the transit center, the 96 would have to get off of the freeway at the Terwilliger exit and travel an extended period on Barbur to reach the transit center. Northbound the connections would even be worse and would adversely affect the lines performance. As I mentioned above loosing one or two minutes would not adversely affect the 43 or the 44 for that matter since they are not major corridor routes (that's not to say they are not busy because the 44 is a very busy route). One of the most important points when it comes to this subject is the location of the transit center. Is centrally located where the largest number of bus routes can conveniently access it without adversely affecting its running time. Of course transit center locations are often chosen from a host of other reasons that do not put riders first from cost, NIMBYism, sweat heart deals, and of course politics. When it comes to deviating routes to a transit center you need to take into consideration how easy would it be for riders to walk to routes that don't directly deviate into the transit center, the potential ridership of making convenient connections, time factors and location. The ultimate decision needs to rest on whats best for the customer and what will encourage people to ride. Now that the passenger rail future of Florida is coming into focus, This Week reviews how we got here. As most of our readers are aware, everyone involved in producing This Week at Amtrak has an inextricable link to the Sunshine State. Obviously, the passenger railroading world does not revolve around Florida. Even so, in a place where our usual entertainment is either watching one of our fellow citizens defend himself in court or watching the foreigners attempt to navigate our roads, our rail on-goings are a welcome change. In just the last year, two projects have been run through the meat grinder known as the court of public opinion. The final outcomes could not have been any different. Up until now, we at This Week have been loathe to mention SunRail and Florida HSR in the same sentence due to the mass perception that a rail is a rail. Therefore, yet again we beg the indulgence of our readers, as we take This Week back home for one more issue. The time has come to make the difference profoundly clear. “Are sufficient transit infrastructures available (or planned) to feed the rail system? Would tourists, many of whom now come in by car from out of State, switch modes once in Florida? Could other tourists be induced to ride the train with the current cost, service, and convenience factors provided by competing modes? Would private capital be sufficient to cover a project of that magnitude? Are there transportation alternatives that might better meet the State’s needs?” - U.S. Passenger Rail Technologies (Washington, D. C.: U.S. Congress, Office of Technology Assessment, OTA-STI-222, December 1983). The undertaking was as grand as the times we were living in. Truth be told, the 1990s were a great time to be alive. The Northeast was in line to get high-speed trains, and it was believed Florida would come in second in this friendly race, which was more than acceptable, since we were starting from scratch. With the State of Florida continuing to grow with no abatement in sight, it seemed only natural to enhance State infrastructure to meet future demands. The initial and future route regimen was simple and attainable; and then politics intervened. Within two years, the proposed route map exploded with high-speed routes running amok through every corner of the state. This phantasm along with its bloated price tag was mercifully put out of its misery by then-Governor Bush before the end of 1998, yet this was by no means the end. What transpired over the next 10 years is what we here refer to as “high-end entertainment.” In 2000, the voting public approved an amendment to State constitution, mandating the establishment of a system of high-speed trains. The Florida High Speed Rail Authority (HSRA) was created the following year. Although State funds for HSRA were vetoed by the Governor, Federal funds kept it afloat; efforts in planning a system continued. In 2004, the voting public approved a repeal of the high-speed train amendment, but the HSRA continued to meet, and completed the environmental impact statement (EIS) for the route between Tampa and Orlando. Ah, but now there was no more funding, and it seemed all for naught; yet, this is Florida, after all, and nothing is ever as it seems. In 2009, the clarion call went out all over the land for High-Speed Rail. This call was answered in many corners of the country, but ultimately only two of the responses were close to plausible: California, which had its own long history of pursuing HSR; and Florida, which had its own EIS. As a result, Florida became the front runner for establishing, for the first time in the Western Hemisphere, a true high-speed railroad; even if it was only to be 84 miles long. The overall usability of the line was not the point, but rather the establishment of the ground rules for further HSR around the country. Unfortunately, this was no longer the 1990s. Those halcyon days were long past, and the pale of a new era was only beginning to be understood by the masses. Florida, especially, was coming to grips with this new era. The 20-year boom era of about 1985 to 2005 had given way to bust and freefall. Most insidious of the boom days were the final few years, where real estate values skyrocketed on speculation, and home builders built houses for buyers who did not yet exist, but who they were sure would come. By the end of the first decade of the 21st century, it was plain that the prospective buyers were not coming. Millions of dollars of new building would remain vacant or sell dirt cheap. The last thing the citizenry wanted to hear about was some fancy new fast train that might put it on the hook financially for some indefinite period of time. Hunger will have that kind of affect on people. Consequently, the project went back on the shelf in 2011. It may sound duplicitous, but the writers were in favor of the FOX back in the 1990s. It was a good idea. It was something we could afford…at the time. Was it perfect? No. It did not serve the downtown areas of the cities it was meant to connect, but the hope was that it could, someday. The Florida HSR of 2009 followed the same basic idea. Why not support it now? There was absolutely no guarantee the monies would ever be available to connect into downtown, let alone extend to South Florida. Although the landscape looks familiar, the reality is that we are in a very different place now. With these changes come shifts in priorities, if not a shift in paradigm. We most certainly have gone from thriving to survival mode, and it looks like we will be here for the duration. As early as 1989, the possibility of commuter rail had been deliberated in Central Florida. Tri-Rail had begun operation two years earlier, and one proposal was to extend Tri-Rail from South Florida to Tampa and Orlando as a way to connect the state. Soon enough, Tri-Rail was experiencing its own tribulations; thus Central Florida would be on its own, and so was formed the Central Florida Commuter Rail Authority (CFCRA). In 1992, the CFCRA released its Project Feasibility Report which was all-inclusive of various forms of transit including light rail, commuter rail, and an increased number of buses to facilitate travel in and around the greater Orlando area. The commuter rail component received Federal authorization in 1998 as part of the Central Florida Rail System in the Transportation Equity Act for the 21st Century (TEA-21). In 2000, the light-rail portion was scrapped. In 2006 the Florida Department of Transportation (FDOT) and CSX, the owner of the existing track in Orlando, agreed on the purchase of 61.5 miles of track between DeLand and Poinciana. For $432 million, the State gets the right-of-way, and pays CSX to increase capacity on the parallel freight line through Ocala for the anticipated traffic which will now bypass Orlando. Perhaps it was ignorance; perhaps it was an attempt to curry favor. For whatever reason, FDOT committed a huge blunder in 2008 when it entered a Memorandum of Understanding (MOU) with Amtrak regarding maintenance of commuter trains at its Sanford Auto Train facility. This would come around to bite FDOT almost two years later. It did seem the whole thing might come to naught in 2009. The Great Recession hit central Florida rather hard, and many questioned the wisdom of spending scarce State cash on trains. Through two sessions of the State Senate, funding for commuter rail, now known as SunRail, was not forthcoming. But remember, this is Florida and nothing is ever as it seems. For the first and last time, an overt tie was made between commuter rail and high-speed rail. The Feds told the State that if the millions of dollars made available for commuter trains were not claimed, then the State could forget the billions of dollars made available for HSR. In an amazing turnaround, the State Senate met in a special session and passed the SunRail legislation. It took almost all year, but in December of 2010 Amtrak dropped its opposition to SunRail following an hour-long meeting in the office of U.S. Department of Transportation Secretary Ray LaHood, with soon-to-be-Chairman of the Transportation Committee, Florida’s own U.S. Representative John Mica, in attendance. Following this calibration, Amtrak issued a statement saying it had “long supported the SunRail project.” Hopefully, going forward, FDOT and SunRail will appreciate that they had best do without Amtrak’s support. Of course, the rest is history. On January 28, 2011, newly-elected Governor Rick Scott put SunRail on hold in order to review the project. On February 26, 2011, he cancelled Florida HSR, citing concerns over possible future operating costs. Then came July 1, 2011, and the official go-ahead for SunRail followed by the official “ground breaking” on the property of Florida Hospital. The caterers expected 300 to attend, but there were at least 400. There was one protester, who did succeed in attaining his fifteen minutes of fame. Many pundits believed the Governor would ax SunRail, since in their eyes all rails are created equal. State supporters of HSR mounted rallies and campaigns to stop SunRail. (Most people did not notice, since the airways were saturated with the trial of one of our denizens who was found guilty of parental antipathy which, as it turns out, is not a crime.) Five days before the governor’s decision, what can only be described as an embarrassment of journalism proffered by a will-write-for-food reporter appeared in the New York Times. Although starting off with “Here in sun-parched Central Florida,” the author obviously had no clue what Floridians are really about, as evidenced by describing SunRail in these terms: “It will not link to the Orlando airport or Disney World, among the region’s biggest traffic generators.” This is a slap in the face to those of us who actually live here, and the Grey Lady owes us an apology for printing such tripe. SunRail is not purposed for the tourists, but rather for the locals. The New York Times made no mention of Florida Hospital or Orlando Regional Medical Center, two of the biggest employers and traffic generators in the City of Orlando. Their master plans; not their plans for future development, but their actual master plans as filed to the governments per State law; are contingent on SunRail. 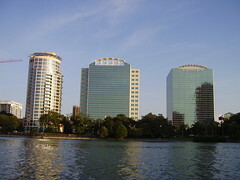 For example, a Florida Hospital station is to be provided by Florida Hospital according to its master plan, and Florida Hospital has already provided the infrastructure for it. During the ground breaking, the hospital announced the impending construction of a new administration building to be sited next to the future station site. This is a case where it will not be feasible to just deny the commuter train and build a road, instead. The whole "Medical City" concept will have to be reconsidered, with much of it already in the ground. Unfortunately, with all this “rail” talk, the lines blurred. Most media outlets cannot tell the difference, with one even referring to “high-speed commuter rail.” Florida HSR did do some good in that it prompted enough elected non-stake holders outside the Orlando area to vote in favor of SunRail. Ultimately, Florida HSR failed because it was the purview of out-of-state interests who, once it served its purpose of setting the new standards for domestic HSR, could easily walk away, leaving it to the locals. The questions raised nearly 30 years earlier are still pertinent and remain inadequately answered. SunRail succeeded because it is from the locals. Local stakeholders understand it will have cascading benefits on other local interests such as engineering and construction companies, all of which are eager for work in our recession-ravaged state. The locals also understand that this is their baby, for which they will be responsible. Yes, Mr. Secretary, we did get our act together. SunRail is (finally) happening. I just purchased my TriMet monthly pass for October, which is the third one I have purchased since moving to Portland in mid-July. It has been a few years since I have regularly commuted by transit since I could walk to my last job in Salt Lake so taking a transit trip was something special. For the most part there is little to talk about on my commutes. My trips usually involve trips on bus and then connecting for a three station ride on MAX. I usually enjoy my first bus trip of the day because it is reverse commute to the Beaverton Transit Center and is not very busy. It is long enough that I can get some reading done before arriving at the transit center and connecting to MAX. On my return trip I usually take MAX to the Goose Hollow station then ride the 6 down to Park in order to go pick up my mail. For the most part, my commute is pretty routine which is a testament to how well TriMet does work despite the whining by some circles including some of its bus drivers. However every once in a while something will happen that will make the commute interesting and the last couple of days it has been on route 6 despite the fact I only ride it a few blocks. Yesterday the incident was one that would get your blood pressure up and today's was one that makes you laugh. Yesterday the bus pulled up, and the doors opened. I always wait to see if anyone is getting off. There was one guy sitting near the front but he did not move so after a few seconds I started to board. The guy then starts yelling at me that he is getting off with a walker and why didn't I clear the way for him. I just moved around him and sat down. He then yelled at me some things that I will not repeat and got off the bus. Then there was today. There was already a bus sitting in the bus stop area but he wasn't departing for 15 minutes. Another 6 came and pulled up behind him with the regular driver I usually have on this run. A Asian lady gets off the bus with when of those folding shopping carts. The problem is as you can see from the google view the bus cannot park perfect so there is always a gap between the bus door and the curb. As the lady gets off the bus she the small wheels on the back of her folding car come off. She starts yelling at one in particular in her native language, then walks to the wall on the other side of the sidewalk leaving her cart stuck between the bus door and curb. The driver tries to shut the door to move the cart but it just fell back in. I guess he expected either me or the other passenger to move it but after a moment he put the parking brake on and moved the cart himself. The bus pulled away with the lady just staring at her cart. Starting Monday my journeys will become longer so I should have even more interesting encounter as a TriMet rider. As sands through the hourglass, so are the history and future of passenger rail in America; unrelenting. *This newsletter contains forward-looking statements within the discretion of the prognostic abilities of the writers. Our forward-looking statements involve expectations, projections, goals, forecasts, assumptions, history, and flat-out guesses. The writers may be spot-on or completely out to lunch. Whatever the case, our readers may rest assured we will be there to document it. Just 245 days after man landed on the moon, the California Zephyr completed its final run on March 22, 1970. The California Zephyr was considered to be the last word in overland travel in America; perhaps the finest conveyance in the world, but now it was gone after a mere 21-year run. For most Americans this was just a passing of the torch, no different from the demise of the stagecoach or the interstate canal network, for the year is 1970; the Interstate Highway System now makes possible national travel on your schedule. Gasoline is a national-average 36 cents per gallon ($2.09 in 2011 dollars). Jobs are plentiful and so are automobiles. The only real limiting factor of mobility is one’s endurance. The long road to this reality has been told to the point of being hackneyed. Following World War II, the nation became flush with largess by virtue of its infrastructure remaining intact. Even though the national treasury was empty as a result of the conflict, billions of dollars were “invented” to send to Europe and Japan to rebuild their societies. As a result, those billions of dollars came back to the United States in the form of orders for the material and machines necessary to rebuild. The American worker was a benefactor of this circular cash, giving the average citizen a buying potential unheard of in previous generations. It was the Federal Government which became the primary beneficiary. All of this national income resulted in higher tax revenues, and politicians were more than eager to spend it. The American population was now on a much more level plane than at any other time in human history. With no end in sight to our newfound avarice, there came experiments in socialization. One of these was the Interstate Highway System. While this was pleasing to the American public, it was a millstone around the neck of the American railroads. With billions of dollars going to highways and roads during the 1950s and 1960s, railroads politicked and lobbied for some sort of Federal aid. They rightfully eschewed nationalization, but did hope for some funds to invest as a counter to their subsidized competition. Any dreams of subtle aid were dashed on June 21, 1970 with the catastrophic bankruptcy of the Penn Central (Transportation Company). With the proverbial lid now blown off the true railroad condition, it became apparent to all that the situation was dire; no minor injection of public funds could rectify three decades of decline. In keeping with the spirit of the times, the Senator sought to spend the national largess instead of answering the very basic question, Why are the railroads, themselves, not able to make such investment? By 1970, millions of public dollars had been invested in the Northeast Corridor. With Penn Central now a financial basket case, the Federal Government saw its investment in jeopardy. As early as 1969 there was consideration inside the Beltway as to some Federal involvement in passenger railroading. With the true situation of America’s railroads now making headlines, efforts intensified, and President Nixon signed what was then known as the Railpax legislation into law on October 30, 1970. The main reason for doing so was to forestall any more Penn Centrals around the country. Railpax was renamed Amtrak, and began direct operation of a much-rationalized passenger rail network on May 1, 1971. But with other forms of nationalized socialism taking hold around the country, a little more would not hurt, right? Amtrak has been a reality for 40 years. If you do not believe it, just ask it: http://www.amtrak40th.com/. Amtrak has published a book, a video, and has even commissioned a train to publicize its four decades’ longevity. It has been no small task, and much blood, sweat, and tears have been shed in the process. Even so, there are many larger questions, vastly larger than Amtrak itself, now looming on the horizon. The seemingly inexhaustible largess of the latter half of the 20th century is gone. The age of avarice is over; the era of austerity now grips us. The question of “The National Debt,” and exactly who is responsible for it, is now a subject for debate in every corner store and boardroom. Ultimately, this is all a referendum on what role government plays and what size it needs to be in order to fulfill that role. Everything is out on the table. It is only a matter of time before nationalized passenger rail is under the microscope. The inherent efficiency of a railroad, the thermodynamic efficiency which propelled them to success from their genesis, is once again making them the transportation mode of the future. Unfortunately, such success always comes with its detractors. Special interest groups, specifically utilities reliant upon railroads for shipment of fuels, are actively looking to re-regulate railroads for their own financial relief. The utilities, who answer to multiple state or local agencies for the setting of consumer rates, believe it easier to mandate freight rates down from the Federal level rather than push politically-unpopular higher consumer rates at the local level. Such is the result of socialization of consumer electric rates. Thus far, the railroads have been able to resist such maneuvers to set them back to the era of needless burdensome regulation. But as the era of public cross-subsidization erodes, the search for new sources of subsidy will only intensify. The railroad re-regulation battle is barely out of round one. Meanwhile, Amtrak touts the number of riders it attracts year over year. It is expected that Amtrak will carry over 30 million passengers in 2011. Gasoline has averaged $3.50 to over $4 per gallon so far this year; for all practical purposes, this is about double the inflation-corrected price of 1970. Even so, Amtrak is a socialized government animal which looks more for “rider-voters” than customers. Even during the days of Senator Pell it was appreciated that the high density population in the Northeast would make subsidizing passenger rail politically palatable. Consequently, Amtrak has concentrated more on achieving ever-higher numbers of rider-voters than it has on efficient business acumen. Amtrak’s formula is very simple: High-density, short-haul/low-revenue corridor trains are touted as the solution for congestion; these attract the highest number of rider-voters/constituent-subsidy. The dilution of long-distance/high-revenue trains by lower-than-historical coach fares destroys any potential meaningful revenue, but is touted as the thread of a “national network.” If coach fares were raised in line with what it costs to operate them, and the number of high-revenue cars (sleeping cars) were increased, these trains would have a chance of at least breaking even. But sleepers carry fewer passengers than coaches, thus reducing the number of rider-voters. Also, if this happened, then these trains might be turned over to private operators, and Amtrak would lose its national constituency of rider-voters. Such is the mentality of a government agency, to wit: “We have to protect our phoney baloney jobs here, gentlemen!” Governor William J. Le Petomane – Blazing Saddles. It has been an arduous decade; transition from a guns and butter economy to a guns or butter economy is bittersweet, at best. The American experiment of socialization has ended. The United States was born in defiance of “taxation without representation.” The belief that taxes are a necessary evil defines the American ethos; they are evil nonetheless, and as such, should always be minimized. But the largess of the latter half of the 20th century was too tempting to pass by. When said largess ended, we attempted to fill the void by massive borrowing and hoping, praying for another round of national benevolence which never came. Now the bill has come due. Life in 2020 is much like 1920, if not in form then certainly in function. The public does not travel as much or as far as during the “good times.” Due to expanding worldwide demand, the price of transportation fuel is now well over four times the rate of inflation. Efficiency is replacing convenience. The Interstate Highway System is being rationalized in the same manner as the railroads were during the 1970s and 1980s. Automobiles and airplanes are returning to their original positions, as toys for the genuinely rich. Just as the American public adapted to the era of cheap and abundant fuel, so they have adjusted to the era of expensive and scarce fuel seen during the early days of the Industrial Revolution. The technological salvation everyone was counting on did not pan out. Technology uses energy; it does not create energy. It is no longer 1970. No one is trying to save the passenger train from the guilt of excess. It is no longer 2011. No one is trying to expand the passenger train solely on the basis of an imperious immediacy of political interest. Passenger rail has rebounded due to its inherent efficiency, and it is back in the hands of private industry. Thus, trains are running where they should be, and not where they cannot be justified. “It is time to deregulate America’s passenger rail system, and give intercity passenger rail the same opportunity for success that the freight rail and commercial truck industry have benefited from. It was not too long ago when the call to “reform Amtrak” could be heard around Washington. To those who prefer the status quo, the response was, “Define reform; what do you mean by reform?” Now the focus is shifting from reform toward an orderly dissolving of Amtrak. For older or retired railroaders, Amtrak’s only reason for existence is an “irrational love of trains that would have us run almost empty trains over long distances simply so a foamer can stand out there and watch ‘em.” Perhaps such reasoning was justified four decades ago. Today it is well documented that those trains, especially those long distance trains, run full. They are sold out weeks before departure. This has not gone unnoticed by the private sector; higher demand means higher revenue potential. Higher revenue should translate into profitability or at the very least break-even. Amtrak, however, as a political animal focuses on “rider-voters” rather than passenger miles. Consequently, it has become the greatest of ironies that the passenger train, which was purported to be saved by Amtrak, now has to be saved from Amtrak. Also, Amtrak has become an important conduit for tax dollars to flow into the Railroad Retirement Board (RRB) pension system (of which all railroaders are members) instead of Social Security. Many of those currently employed by the railroads, as well as the retirees, fear that if Amtrak is fundamentally changed then an adverse effect on railroad retirement will occur. What is not realized is that any new passenger railroad venture established, which may augment or replace Amtrak service, will also have to be under the RRB; eventually making the system stronger, not weaker. There is also the possibility Congress may find another funding conduit for the RRB, other than through in-and-out entries in Amtrak’s corporate checkbook. No, history does not repeat itself, but it does rhyme. The “good roads” crusades of the 1920s and Interstate Highway program of the 1950s happened after forgetting the lessons of the National Road debacle during the first half of the early 19th century. Now the lessons of railroad regulation/deregulation have been forgotten by many, and the results are negative. What really is our rail future? It is not ours to see. But whatever happens, we will be writing about it. Hybrid buses...some transit companies have gone crazy having all new buses be hybrids while others such as TriMet in Portland and the Utah Transit Authority have been more conservative when it comes to buying hybrid buses. 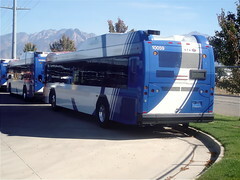 Back in 2002 TriMet received two New Flyer Hybrids while UTA received three of the same type of buses. After evaluating TriMet made the decision not to order any new hybrids until this year because they did not see enough savings to justify the initial high costs of the buses. However, last year UTA received 10 Gillig Advantage BRT hybrid's to go along with a purchase of new regular diesels, and this year TriMet has decided to see how much the changes in hybrid technology in the last decade has changed and ordered 4 hybrids also from Gillig to evaluate their performance. Some would argue that Hybrids use less fuel so transit agencies should by them. Of course life is a little more complicated than that. In fact the experience with hybrids have been a mixed bag largely because how well they save on diesel depends of the type of service they are used on. New York is probably one of the biggest users of hybrid buses. In an environment like crowed New York streets were many of the buses are sitting in traffic or traveling at low speeds the hybrid technology pays off. However, in Seattle the opposite situation exists. Seattle purchased their hybrids to travel in their bus tunnel when it became a joint operation with Sound Transit Light Rail. However, once the buses leave the tunnel a number of them become express routes across the Seattle area. Because they spend a majority of their time travel at higher speeds Metro does not see the advantages of Hybrid technology. Currently Hybrid buses cost substantially more than standard diesel buses. For example TriMet's new hybrids cost approximately $650,000 while the new diesels that TriMet ordered this year coast about $400,000. So lets look at some examples to show what would make this purchase justify itself. As you can see above the difference in price between the regular bus and the hybrid bus is $250,000. Let's say a standard bus gets 4 miles per gallon and a hybrid averages 5 miles per gallon. That means that you would save one mile per gallon. For the sake of this example and to make the numbers easier lets say that the transit agency will put 500,000 miles on it during its life at the agency. Also let's say that the average price of diesel during the life of the bus is $3.00 per gallon to keep the numbers easier. With this example the agency would spend $375,000 on fuel for a diesel bus and $300,000 for the hybrid. The $75,000 savings does not justify the initial cost of they hybrid. In this example it is virtually impossible for the Hybrid to justify its initial cost. There is other factors that need to be considered beyond just fuel cost such as maintenance and resell value but that would most likely go in favor of diesel for maintenance and resell value is so small it is irrelevant anyway. When making decisions on what type of bus to buy we need to look at hard numbers and not just try to feel good. But there is also something to be said for going beyond the bean counter numbers. Hybrid buses can offer other benefits that cannot be looked at on a balance sheet such as quieter operations and points on the political and public relations front. On a profit and loss statement the hybrids may not add up, other factors may be in their favor but a transit agency needs to look at the the life of the vehicle and whether the substantial cost will pay off in the long run. From the United Rail Passenger Alliance. In this issue, the conclusion of our two-part series where we look at the modern-day history and contemplate the future of the NEC. The first six years of Amtrak operations on the NEC could be described as “business as usual.” From coast to coast, Amtrak was taking responsibility for all remaining passenger services, thus the NEC was just another piece of railroad. Operating crews, conductors and engineers, were still provided by the host railroads. Federal monies were made available to prop up the failing railroad infrastructure of the Northeast, including the NEC, until a permanent fix could be agreed upon. For more than five years between May 1, 1971 and sometime in 1976 Amtrak, itself, governed all of its local and long distance trains in the NEC as a tenant of Penn Central. (This is still the case almost everywhere else in the U.S. on other host railroad properties.) PC was still responsible for the dispatching of their freight trains and the many, many commuter trains that PC continued to operate over the NEC facility. It was during this brief but bright moment that the 1973 oil embargo hit the country, and suddenly the population began to take notice that there were still passenger trains running. At one point, the FBI was summoned to investigate a $16 million discrepancy between material purchased and material on hand. By 1979 Congress knew what to do: Increase the NECIP budget to $2.4 billion and extend the deadline for completion from 1981 to 1985. In 1981, the Reagan Administration cut $600 million from the NECIP, and the plan to extend electrification to Boston would have to wait. The wait ended January 31, 2000 when regular electrified service commenced to Boston’s South Station. The four-year $2.4 billion project had its own drama, with FBI raids of contractors' offices. But the biggest fraud would be the Acela Express trainsets; an untested, one-of-a-kind fleet of heavy energy users, dubiously procured and never to be repeated. Asking those states which utilize the corridor to ante up would bring Amtrak closer to solvency. Doing so, however, would mean ceding some degree of control to those states. Repeal of the commuter subsidy “formulas” was attempted in the original version of what became the 1997 Amtrak reform law, but the political clout of the NEC states on both sides of the aisle proved too strong. As of this writing, ceding any jurisdiction of the NEC to anyone other than itself is anathema to Amtrak. Emboldened by shear ownership, the NEC has taken on a life of itself; it is no longer a part of the Amtrak network but rather the core of Amtrak, to which all other lines of service must cede. Amtrak is a political animal, and as such, political expediency will always come before business acumen. Amtrak currently touts its “market share” in the Northeast as 52% between Boston and New York, and 65% between New York and Washington. These numbers, however, are strictly a modal split, as between Amtrak and the air shuttle carriers. Using U.S. DOT Bureau of Transportation Statistics data for intercity travel (non-commuter trips over 100 miles), you get a true “market share” value for rail of somewhere under 2%, and Amtrak itself reports its own paltry load factors. Mobility in the Northeast is just as important as anywhere else in the country, but are these results of a thus-far $30 billion investment worth it? Whereas the 2008 economic downturn was characterized as a failure of business, the 2011 economic malaise has been defined as a failure of government. The populous will spend the rest of the decade, if not longer, asking and answering some very deep and basic questions regarding who pays for what and how much. “Amtrak has repeatedly bungled development and operations in the Northeast Corridor, and their new long-term, expensive plan to try to improve the corridor is simply unacceptable,” Mica continued. “The nation cannot afford to continue throwing money away on this highly subsidized, ineffective disaster. On the international railroad scene, this is already a reality. In Great Britain, the national network of track is owned by Network Rail, a government-created "not for dividend" company. Network Rail's customers are separate and for the most part private-sector “train operating companies” (passenger) and “freight operating companies” who operate under periodically-renewed franchise contracts. An interesting exception to the private-sector passenger operations is the East Coast Main Line: London-York-Edinburgh. The through trains are currently being operated by another government-created company, Directly Operated Railways, because the last for-profit franchise holder, National Express, bailed out in dramatic fashion after discovering it was losing its shirt running trains even over subsidized tracks. Numerous companies, fast passenger and slower freight, operate over Network Rail and have learned how to play well together over somebody else’s infrastructure. The British experience did not come without its fair share of unpleasantries, but in the end the nationalized British Railways were successfully weaned off the public dole, and succeeded by multiple entities; private where profitable, public where warranted. This was not just to keep the trains running, but to grow and continuously improve national rail transportation. Its progeny now have a chance to learn from this experience. The Mica-Shuster initiative was immediately castigated as total “privatization” and declared dead-on-arrival by those who may be on the losing end of this potential transaction. One amusing erudition emanating from this fracas involves invoking the final phrase of the Fifth Amendment, “nor shall private property be taken for public use, without just compensation.” The NEC was “private property” which was ceded by Penn Central to public ownership upon its exodus from the transportation business. Amtrak, a “quasi-public corporation," does have preferred and common stockholders. All of the preferred stock is held by the U.S. DOT. The common stock is held by the successors of the original Amtrak-participating railroads who accepted stock in lieu of tax credits that would not aid their fiscal malaise. Today this class includes a financial group and three class-one railroads. The Amtrak Reform and Accountability Act of 1997 “required Amtrak to redeem at fair market value the shares of common stock outstanding as of December 2, 1997, by the end of fiscal year 2002.” Despite this being law, it has not come to pass. If, indeed, the NEC is property of Amtrak and therefore property of the stockholders, then that stock may be worth more than wallpaper, after all. The other side of the “taking” coin, however, is that Amtrak received the NEC in 1976 subject to a 999-year balloon mortgage, held by U.S. DOT, who holds the mortgage on the NEC property as security on billions of dollars of debt owed back to U.S. DOT by Amtrak; which they cannot repay. All of this is laid out in Amtrak’s annual report. Thus, it is not a question of a “taking,” but one of foreclosure on a lien that has existed for 35 years, is in default, and is callable whenever U.S. DOT chooses. That is a matter of political and commercial will, not constitutional rights. Extinguishing the mortgage in return for a title transfer to U.S. DOT could also eliminate the constitutional objection. Moreover, current law [49 U.S.C. 24907(c)] already immunizes and indemnifies Amtrak and its board of directors from liability regarding any transaction “related to” the mortgage. Also, a foreclosure would not necessarily directly impact Amtrak’s operating rights, except to the extent that U.S. DOT or its successor might choose to price access to the infrastructure at levels closer to actual cost recovery. Even that would not change anything, except to make the actual accounting losses of the NEC (especially Acela) a lot more visible. Separating the NEC from Amtrak with all its legal gyrations will take a few years. Even then it is highly unlikely the property will be in the hands of one or more private companies. More likely is a compact of those Northeast states that will hold and become responsible for the whole corridor. (Congress pre-approved such interstate compacts for passenger rail service in the 1997 Amtrak reform law.) Today there are five state commuter agencies operating under the wire of the NEC. Add to this Amtrak and limited freight operations. Yet, once upon a time this was all under the banner of one railroad. Will we ever make it back to one operator? The Baltimore & Ohio’s overreach of the late 19th Century bears out a pertinent object lesson for us today. The B&O concentrated its resources on a short-haul piece of railroad due to its location in what was believed to be the most valuable stretch of real estate in the country. As a result of neglecting their long-haul routes to the west, however, the railroad would become an “also ran.” The B&O would be controlled at various times by various railroads including the PRR. Ultimately the B&O found security as a lesser partner of the Chesapeake & Ohio. Today there are no major railroads headquartered in Baltimore. This is the purposeful outcome of the free market. Today Amtrak, self-described as “America’s Railroad,” pours the lion’s share of its meager resources into the NEC to the detriment of the national network. Unfortunately, as a public entity, the laws of the free market are not allowed to be applied. Amtrak points to sheer passenger counts, opposed to passenger-miles, as justification for this aberration. With government deficits growing and public patience waning, this dichotomy cannot continue indefinitely. The longer the decision is forestalled, the fewer resources will be left available to enact said decision. Inaction is an expensive option which is no longer plausible. One cannot discuss Amtrak without at least a basic knowledge of the Northeast Corridor. What exactly is the NEC? In this first installment of a two-part series we examine the rise and fall of the NEC. To understand the United States, one must contemplate the challenges of those earliest days of the Republic. The two largest cities on the East coast, New York and Philadelphia, were a six-day journey by horse and boat for the founding fathers. Yet as early as 1811, Colonel John Stevens, the father of American railroading, petitioned the New Jersey Legislature to charter a railroad between Trenton and New Brunswick. His request was denied. His sons would build the storied Camden & Amboy Railroad in 1834 from a ferry connection in Philadelphia to a boat dock on the Raritan River in South Amboy, New Jersey. The Philadelphia & Trenton Railroad was built and fully operational in 1835. The Camden & Amboy completed a branch between Trenton and New Brunswick in 1839. That same year, the New Jersey Railroad completed its line between Jersey City and a connection with the C&A at New Brunswick, and initiated through service from the New York City area to Philadelphia. A journey that had taken six days a quarter-century before could now be completed in a matter of hours. A similar story can be told south of Philadelphia. In 1832, the New Castle & Frenchtown Railroad commenced operation in Delaware. After numerous charters and a few false starts, numerous smaller roads were consolidated into the Philadelphia, Wilmington & Baltimore Railroad in 1836. Through service between Philadelphia and Baltimore began in 1838. By 1851, it was possible to travel from New York to Washington, DC in 12 hours via a connection with the Baltimore & Ohio Railroad. Following the American Civil War, railroads began their transformation from local concerns to national institutions. By and large it was these ideals that were at the heart of the war, itself. The Pennsylvania Railroad acquired control of the C&A, P&T and NJRR roads in 1871. After a battle for control with the B&O, the Pennsylvania Railroad gained control of the PW&B in 1881. As a result, the B&O would build its own line from Baltimore to Philadelphia. What followed is a lesson in corporate overreach. There had been a proposal in the 1860s to build a "National Air Line" railroad between New York and Washington. It was supported by the then-upstart PRR, and opposed by the established B&O, which already had a line between Baltimore and Washington. After the B&O successfully fought off the "Air Line" repeatedly, it then found that the PRR was buying up the other railroads with which the B&O had been connecting for traffic between New York and Washington (the Baltimore and Potomac was the last piece, and then the B&O would be cut out). So the B&O built its own line to Philadelphia, at a time when the original B&O, and particularly the West End, were still unimproved and badly in need of investment; thus perpetuating its slide from the first-place East-West trunk line to third-place behind the PRR and NYC. The story of the Baltimore & Potomac Railroad is somewhat more colorful. Originally chartered as a regional road to connect the farms of southern Maryland to the ports in Baltimore, it was purchased by a group of associates of the PRR in 1866. A “branch” was built in 1872 between Bowie, Maryland, and Washington, DC. In 1873, tunnels were completed in Baltimore, allowing connection between the PRR-owned B&P and the PRR-friendly PW&B. Within a decade, the PRR would control its own railroad in what was considered the most valuable stretch of real estate in the country. North of New York the tale is equally as complex and historic. The first link was the Boston & Providence Railroad, which began operation between its namesake cities in 1835. The New York, Providence & Boston Railroad began through operation in 1837 between Providence and Stonington, Connecticut. In 1848 the New York & New Haven Railroad completed its line between New Haven, Connecticut and a connection with the Harlem Railroad to access New York. In 1858 the New Haven, New London & Stonington Railroad completed the last link, and by 1859 an all-rail route with two ferry crossings was possible between Boston and New York via four railroads. The NYP&B purchased the NHNL&S in 1864. In 1872, the New York & New Haven combined with the Hartford & New Haven Railroad to become the New York, New Haven & Hartford Railroad; thus began an insatiable quest for consolidation in Southern New England. Germane to the Northeast Corridor, the NYNH&H, better known simply as the New Haven, acquired the NYP&B in 1892. The Old Colony, which had leased the B&P in 1888, was itself leased in its entirety by the New Haven in 1893. With all of its acquisitions, the New Haven controlled all rail traffic in Southern New England and in so doing then possessed three separate routes between New Haven and Boston: The Inland route via Hartford, the “Air Line” which avoided all major cities as well as the State of Rhode Island, and the Shore Line route which hugs the northern banks of Long Island Sound. Sometimes holding all the cards means control of one’s destiny; and sometimes it means too much of a good thing. The New Haven was a pioneer of electric traction utilizing low-voltage direct-current applications as far back as 1895 on many branch lines. The New Haven connection to New York was then part of the New York Central System, and as a result of a horrific accident on the NYC in 1902, steam locomotives were banned by city ordinance after 1908. The New Haven would use the NYC third rail system into the city, but had much more ambitious plans for the rest of its main line. In April 1907, the first high-voltage overhead catenary was energized between the end of third-rail territory and the power plant at Cos Cob, Connecticut. By the end of that year, wires had been extended east to Stamford. In 1914, electrification had reached New Haven. Numerous branch lines for freight and passenger service were also electrified. Had economic conditions not worsened, the electrification program would have continued, possibly to Boston. For the PRR, of course, owning the premier transportation system in the country had its own responsibilities. As the final years of the 19th Century wound down, traffic on the PRR continued to grow. Even so, terminating at Harsimus Cove, like so many other roads on the Hudson River, did not meet the expectations of the “Standard Railroad of the World.” After much consideration, a plan of attack was reached in 1901 wherein the PRR would access New York and beyond. Tunneling beneath the solid rock of New Jersey’s Bergen Hill and then slogging through the muck that is the river bottom, the PRR would not just enter Manhattan, but would make the grandest statement in passenger railroading travel: Pennsylvania Station New York. It would not stop there. Working in conjunction with the New Haven and PRR subsidiary Long Island Railroad, four tunnels would connect Manhattan to the Borough of Queens and then a spectacular connection to New England via a bridge over the East River at Hell Gate. Upon its completion in 1910, the new electric division from Manhattan Transfer, New Jersey to Sunnyside Yard in the city Borough of Queens was powered by low-voltage third-rail DC electricity as the result of the city ordinance banning steam locomotives. Even then the PRR was contemplating electrification of the railroad in a manner without the restrictions of low-voltage DC, high-voltage overhead catenary. In 1915, it electrified the Main Line between Philadelphia and Paoli. This was followed by extensions north to Trenton and south to Wilmington. In 1928, the PRR announced its intention to electrify north to New York, replacing the original third-rail system except for what was needed by the LIRR (the New Haven had extended its overhead electrification to Sunnyside Yard in 1917). Despite the Stock Market crash of 1929 and Great Depression of the 1930s, the expansion continued with plans to electrify to Washington and Harrisburg. Service to New York began in 1933, to Washington in 1935, and to Harrisburg in 1938. Much of this was underwritten by Federal loans of some $107.5 million. It should be noted that the improvement to what would later be called the Northeast Corridor was not the only PRR plan for massive improvement. In 1905, the PRR incorporated the Pennsylvania & Newark Railroad, to build a parallel freight route from the yard at Morrisville, just south of Trenton, north; connecting to a freight yard in Newark. Work was suspended in 1916 due to wartime scarcities, and never restarted. The PRR had also planned building an entirely new mainline to the Midwest running west from Lewistown, Pennsylvania, across Ohio, and well into Indiana. This new low-grade line would have given the PRR the shortest and fastest link between New York and Chicago. For reasons left to speculation, the PRR decided to improve its line between Washington and New York. This would unwittingly set the stage for passenger railroading in the later decades of the 20th Century. By the mid 1960s, America’s railroads were in trouble. Not only was the once-mighty PRR not exempt from this pain, but in many ways was its full embodiment. The radical improvement of the 1930s which made the PRR the paragon of transportation now weighed like a millstone around its neck. Overly-burdensome regulation from early in the 20th Century had ended the PRR program of continuous self improvement. This was followed by the post-war largess manifested in the Interstate Highway program; an open-access network of asphalt and concrete, underwritten and maintained at the expense of the American taxpayer. Passenger trains had always been guaranteed enough cross revenue from freight through the rates set by the Interstate Commerce Commission. Now with freight (especially the premium carloads) leaving for the subsidized highways, there was no longer enough to go around. For the New Haven, things were even worse. Having a dense regional railroad in a small industrial area of the country made sense before the age of subsidized roadways. With the coming of the Connecticut Turnpike and New England Thruway, the New Haven did not stand a chance. In the decade of the 1960s, the economy of the country was running like a well-oiled machine. Every corner of business was garnering its share of the national largess with one notable exception: The railroads. Increase in business revenue correlated with an increase in internal revenue, and much of this went to the railroads’ new competition: Socialized transportation in the form of interstate highways and airports. Meanwhile, Japan was continuing to rebuild its infrastructure. As it did not enjoy national largess, it was imperative to make the most of what it did have by rebuilding and improving on existing technology. Thus, after rebuilding its railroads, Japan took the next logical technological step of speeding up its railroads. Its 125 mph “Bullet Trains” captured the imagination of the world, and the imagination of at least one person in the U.S. Senate. After all, that money in the U.S. Treasury was not going to spend itself. Claiborne de Borda Pell served in the U.S. Senate representing the people of Rhode Island for six terms starting in 1961. He will always be best known as the father of the Pell Grant, which offers tuition aid for college students. Immediately following his election, he turned his attention to the possibility of high-speed trains in the Northeast. He aroused then-President Kennedy’s enthusiasm for the idea, and this led to the initiation of feasibility reports by the Commerce Department. But how to pay for it? Apparently, all the other possible options were discarded rather quickly. Following the release of the Commerce Department corridor studies in 1964, Senator Pell introduced (and Congress passed) the High Speed Ground Transportation Act of 1965. Signed into law by President Johnson, the Act authorized in 1965 an expenditure of $20 million, and $35 million the next year. These funds went to upgrades to the railroad right-of-way between New York and Washington, DC, as well as to the purchase of the now famous Metroliners; 50 multiple-unit cars capable of 120 mph speeds, from the Budd Company. This was the era of “The Great Society” where all the nation's woes could be cured with copious quantities of public money. Sadly, such was the mindset of the age of avarice; throwing money at problems was much easier than solving problems. All around the country, the railroads were losing traffic to government-subsidized competition. This atrophy of traffic led to the mistaken notion that parallel railroad mergers would equate to survival, thus leading the PRR to merge with its long time rival, the New York Central, in 1968. Part of the PRR’s agreement to allow its property between New York and Washington to become a guinea pig for an imperious immediacy of political interest was the hope of a favorable decision to grant its merger. Unfortunately, in less than two years this misbegotten union called Penn Central became the single largest corporate bankruptcy in history up to that time. How has this public corporation fared in its governance of the NEC? This will be addressed in our next installment.